Check out this gig I’m doing for free this Sunday in Think Tank Eustace Street, with my Band. It’ll be videoed so if you want to be involved come on in. And if you can’t make it it’ll be up on www.mixtape.ie in about 5 weeks. It’s on at 4 pm so cmon in! A big thanks to all who waited around for our gig on the Main stage at Knockanstockan yesterday as it rained during the first half of the set and then the sun came out halfway through. Thanks to Rama on bass/vocals, Eimear on fiddle, Enda Roche who played drums, and Mark McGuigan who played guitar on a few songs. There were loadsa great performances. Highlights of the festival for me were Brian Keary’s amazing classical guitar performance first thing on saturday, The Prairie Dawgs, Ophelia, Cotton Pickin Rodeo Clowns, Lisa O Neill, Fia Rua, New Secret Weapon and The Hot Sprockets. 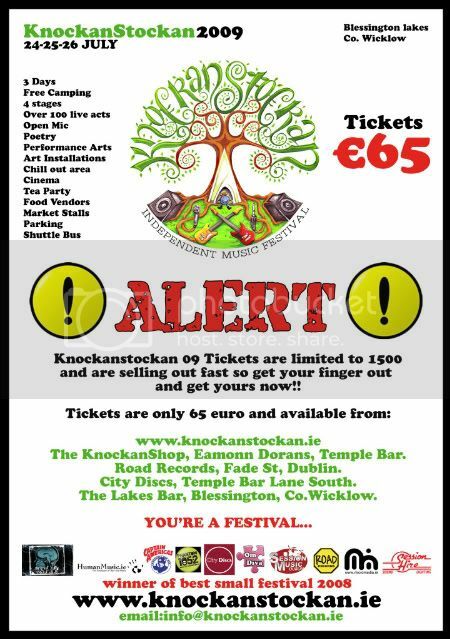 Well I’ll be playing the Knockanstockan Festival this Sunday at 4pm. Hope to see you there.